The waterfall is located in the village of Ban Don Siat, in Seka district. 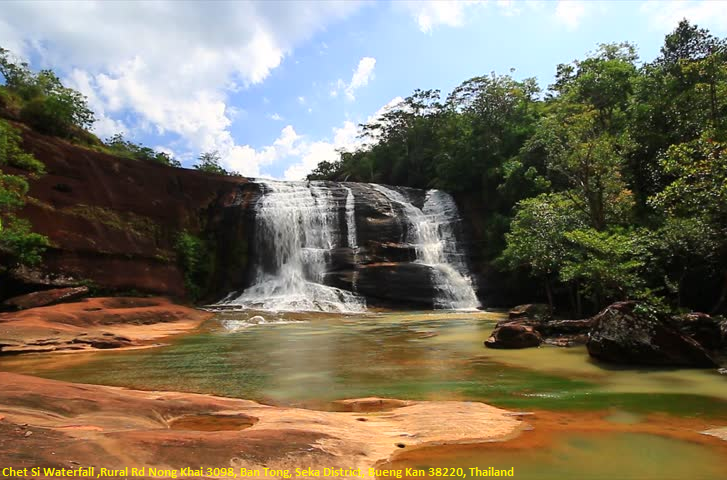 This beautiful waterfall, especially during the rainy season, comes from a stream of Huai Ka-am and flows along a high sandstone cliff before spreading out. This very, especially during the rainy season, beautiful waterfall originates from a stream of Huai Ka-am and flows along a high sandstone cliff to spread over a long line. The falling water that hits the rocks below causes a spray of water which gives rainbow colors when seen in sunlight. So came the name “Namtok Chet Si,” which means a waterfall of seven colors. The "official" start-point of Chet Si is at a small parking lot from where you take a 30 minute challenging walkway along the stream trough the trees to eventually reach a massive waterfall. Note that during rain season the walk along the stream is partly through the stream.Chet Si waterfall is open from sunrise to sunset, and specially during weekends and national holidays a joyful gathering spot for Thai people, enjoying food, drink and swim in waterfall......Majority of waterfalls in Thailand only have water during or just after rain-season.